A Cape Cod Private Estate Wedding is a delightful event for all who attend. The beauty of this Massachusetts cape, combined with its historic, maritime character and beaches, have made Cape Cod a popular place for visitors in the summer months. 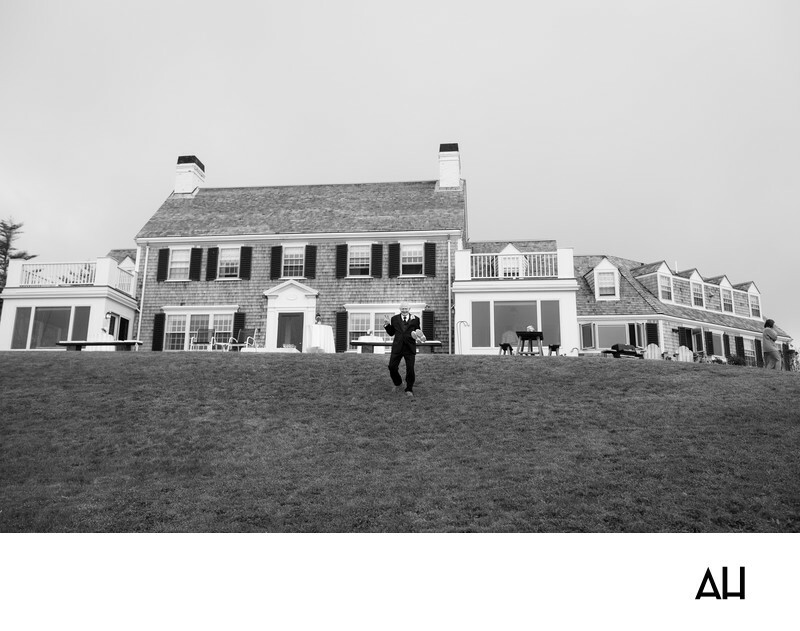 In this black and white image from a summer Cape Cod Private Estate Wedding, the bride’s grandfather is seen walking down a hill on the property. The house stands regale in the background of the photo, looking out at the water. Windows cover the facade of the home, so that the small beach at the bottom of the hill and the water that stretches out to the horizon can be seen from a number of places within it. Black shutters frame each window of the gray and white building, contrasting with most the gray coloring the makes up the rest of the picture. The other stark black color in the picture comes from the grandfather’s suit. The older man wears a black suit, vest and tie, over a pristine white dress shirt. He carries his dress shoes in one hand, and throws up a peace sign for my benefit with the other. His shoes are off as he steps carefully down the grassy hill, making his way to the sand below. The image shows the grandfather in a carefree, fun way, and it gives the impression that this man is very much young at heart. The picture captures that energetic spirit, which permeated this magical Cape Cod wedding day.